Brace yourselves for another Apple patent. It’s a weird and wacky one. It’s about using a “seamless” biometric heart rate monitor to identify iPhone users. Brace yourselves for another Apple patent. It’s a weird and wacky one. It’s about using a “seamless” biometric heart rate monitor to identify iPhone users. Seriously. Your boom-tiddy-boom could unlock your iPhony-phone. Apple’s patent couldn’t be simpler: Part of the metal shell of an iPhone (can you say iPhone 2010, anyone?) 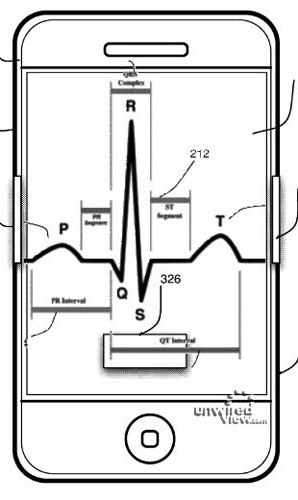 is replaced by electronic sensors that detect the pulse of the user’s heart as it reaches the hand holding the phone. Peculiarities in each user’s heart patterns at the cardiac level, transmitted through their blood vessel network, result in a signature that the iPhone can then detect and use to identify particular persons. Thus logging in to your iPhone could become as easy as just picking the damn thing up and waiting a second or two (typically about the same time it would take to press unlock and tap in a PIN number, anyway). But Apple is wading into tricky waters here. Biometrics is one of those “cool” technologies that seems like a fabulous idea but in reality is often either a bit of a disappointment, a frustration, or a downright security hazard. Witness: The U.K.’s wizzy new biometric identification passports, which can be hacked in seconds by a remote baddy who then has access to personal data, ready to simulate your person at the next biometric security check. Witness: Those funky fingerprint sensors on high-end laptops and some thumb drives, which take five swipes of your digit to recognize you (and which Mythbusters has proven easy to physically “hack”). But this sort of issue doesn’t kill enthusiasm for the tech at all, or so it seems. The cofounder of Valve, the huge computer game firm, recently expressed enthusiasm for biometrics as an advanced user-feedback system inside games. “Pupil dilation, heart rate–those are techniques that are going to give our games enormous impact in the future,” Gabe Newell told an audience at the Games Developers Conference in March. Presumably Gabe is talking about varying in-game content to react to how excited a gamer is by the preceding play, but who knows–maybe future zombie horror games will be able to analyze you and work out when the best point to absolutely terrify seven shades of crap out of you. Apple’s own patent makes the most of the heart rate detecting powers in terms of health as well as user identification–simply building on its long-standing basic biometric system developed with Nike. And even EA Sports, in cahoots with Nintendo and Sony, has its “Active 2.0” peripherals en route, including a multi-point body motion sensor, and heart rate monitor. These biometric feedback systems drive data into healthy sports games on the Wii and PS3, though Nintendo has tapped a wholly different “weird” biometric vein with their design: The gizmos are only in white, since black strap-on sensors looked “heavy” and may dissuade users. And that’s the thing isn’t it? Don’t we all have that slight distrust of devices designed to measure, quantify, assess, and rate our biological systems? It’s a continuation of the nerve-inducing sight of a white-coated medic, perhaps . . . added to a sci-fi movie-induced nervousness that your personal biometric data (complete with, yes, skeletons in the closet) will end up in an unsavory corporation/governmental body’s grip. Wouldn’t some of the joy of using an iPhone be sapped by the thought that when you pick it up not only is the thing using your heart rate to identify you, but it’s logging changes in your heart pattern and might at some point chastise you with a “push” notification to lay off the burgers?